It took about three months, but TRENDnet finally resumed shipments of its TPL-420E2K HomePlug Powerline 1200 AV2 Adapter Kit. The QCA7500 based HomePlug AV2 MIMO adapters went on hold at the end of March to fix a hardware problem that TRENDNet said affected medium and long distance performance. Both the old and new adapters are marked H/W: V1.01 and F/W: 2.0.0.375 on the outside of the product box and on the adapter's serial number label. 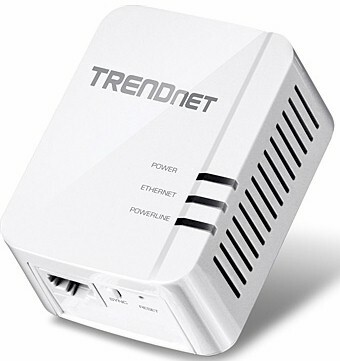 But, thankfully, TRENDnet added a /A to the model number as highlighted in the comparison of old and new adapters below. You'll find TPL-420E2K / A on the product box and adapters, so you'll know you have the new model. The original review has all the product details, so we'll move right to the performance retest results. A pair of TPL-420E2K adapters was tested using our standard powerline test procedure, with all results entered into the Powerline Performance Charts. There are now four AV2 MIMO adapters to compare, so the throughput plots this time also show NETGEAR's PL1200, D-Link's DHP-701AV and ZyXEL's PLA5405KIT. The Downlink Throughput plot below shows NETGEAR's PL1200 having the highest throughput (391 Mbps) in the best-case same-outlet Location A, followed by the ZyXEL (333 Mbps), then the TRENDnet (322 Mbps). None of the adapters approach the TRENDnet's previous 433 Mbps in Location A. The only location where the TPL-420E2K adapter leads the pack is worst-case Location E, but only by 4 Mbps over the NETGEAR. Uplink results show the 420E2K in second place with 378 Mbps behind the D-Link DHP-701AV with 401 Mbps. The D-Link turns in the best overall showing running uplink, with the highest result in each case, especially in mid-range Location C.
The simultaneous up /downlink IxChariot plot for the TPL-420E2K at Location A shows downlink and uplink throughput taking turns in the lead, similar to the previous test. But both up and downlink average throughput are lower this time, for total throughput of 389 Mbps vs. 481 Mbps previously. Adding more simultaneous streams still adds more bandwidth, but only about 13%. Compared to the previous results, uplink in both pairs is again favored over downlink, with similar throughput. Downlink throughput for each stream is about half the previous value, i.e. 37 / 27 Mbps vs. 70 / 75 Mbps. Location E noise tests were about the same as before. Throughput quickly moves from the with-noise throughput line to the without-noise line when the noise source is removed 30 seconds into the test. I held off awarding a Ranked #1 award to the TPL-420E2K pending the retest results. With the retest done, the #1 Rank award for AV2 MIMO powerline adapter can now go to NETGEAR's PL1200. The TRENDnet, on the other hand, moves down to tie ZyXEL's PLA5405KIT for third place. The Powerline Ranker Performance summary for the NETGEAR and TRENDnet show higher average downlink and total simultaneous throughput are keys to the NETGEAR's top rank. Both adapters ranked #2 for average uplink throughput.